Same great Ready Index® product now made entirely from recycled materials. Coordinated system of reinforced table of contents page and matching preprinted tab dividers. Three ways stronger to last longer. Stronger, heavier weight paper is more durable. Stronger reinforcement keeps tabs from tearing. Double-sided hole reinforcement prevents divider from tearing out of binder rings. Quickly create your table of contents page with Avery's free "quick fill" templates. Same great Ready Index® product now made entirely from recycled materials. Coordinated system of reinforced table of contents page and matching preprinted tab dividers. Three ways stronger to last longer. Stronger, heavier weight paper is more durable. Stronger reinforcement keeps tabs from tearing while the double-sided hole reinforcement prevents divider from tearing out of binder rings. Quickly create your table of contents page with Avery's free "quick fill" templates. 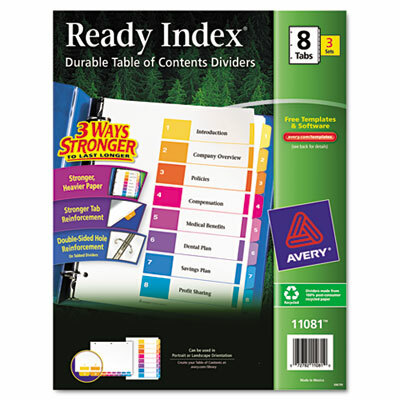 Only Avery offers so many easy-to-use templates and software solutions.